In 1954, young Catholics had to build their own recreation center after the late Archbishop Julio Cardinal Rosales forbade them from using YMCA facilities. This is a SunStar multimedia report on how Catholic youth recreation center Patria de Cebu was built, what the plans are for its redevelopment, and how the Archdiocese of Cebu and developer Cebu Landmasters Incorporated intend to preserve its heritage. IN the early 1950s, a group of young men and women literally got their hands dirty and made their own hollow blocks so they could build a recreation center for Catholics. Upon taking each hardened block out of the iron mold, they prayed one Hail Mary. “I made a hollow block, then said Hail Mary. Then I made another and said another Hail Mary. One Hail Mary for each hollow block,” education tycoon Augusto Go, now 83 years old, recalled. He said they made the hollow blocks at a vacant Church property behind what is now the Cathedral Museum of Cebu. Go, president of the University of Cebu, was a college student at the University of San Carlos (USC) when he and his friends volunteered to undertake the project. The students were members of the Student Catholic Action (SCA), a religious student organization backed by the Catholic Church. The Hail Mary prayer, which seeks the intercession of the Blessed Virgin Mary, is also known as the Ave Maria. The late Dr. Lindy Morrell, who was then a Catholic lay leader and one of the prime movers of the project, wrote in his blog in 2008 that he called the prayed-over concrete blocks the “Ave Maria blocks”. These “Ave Maria blocks” were painstakingly laid in an interlocking pattern to build the Patria de Cebu, a Catholic youth recreation center known then for its bowling alley and billiard tables. It is also Cebu City’s first earthquake-proof building because of its tie beam system, according to Morrell. Patria currently serves as a hostel and houses the offices of the Archdiocese of Cebu units. Making the hollow blocks is just one part of the story of how the structure was built in 1954. It had been about a decade after the end of World War II and the YMCA (Young Men’s Christian Association) along Osmeña Boulevard was the only youth recreation center in Cebu City. It was, however, off limits to Catholics because it was set up by Protestants. Morrell wrote in his blog, “Penpoints: How the Patria de Cebu was built” that the late Cebu Archbishop Julio Cardinal Rosales forbade Catholics from availing of YMCA’s programs. With the help of Father Bernard Wrocklage, SVD, from USC, Morrell wrote that they challenged the SCA to build a recreation center for the Catholic youth. The archbishop, upon learning of the plan, offered a Church property as the project site. But this property, located across the Cebu Metropolitan Cathedral, was occupied by informal settlers. Before they made the hollow blocks, the young Catholics had to address the twin problems of where to get the funds to finance the construction of the building and how to convince the informal settlers to move out of the property. Go said he and his friends went to Carbon Market with donation boxes to solicit any amount. Some people gave five centavos while others, 10 centavos. Wrocklage also drew up a list of American bishops and parishes across the United States of America. The young volunteers then gathered at the Sto. Rosario Parish, where they had set up their base of operations, and typed solicitation letters that were sent to the bishops. Go said the response was very encouraging and they received a substantial amount with which to build the facility. But the problem with the informal settlers remained. 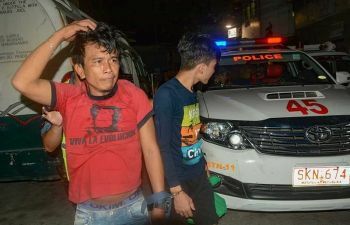 In his blog, Morrell wrote that they were able to convince the informal settlers to relocate to the idle grounds of the former Cebu City Hippodrome (now Barangay Hipodromo), but not before one of the leaders tried to hack them with his bolo. Wrocklage, however, put himself between his student and the enraged man with the bolo. Morrell said the brave priest told the man to kill him first. The man backed off and later agreed to be relocated. Morrell said Go offered his flatbed truck to haul the houses of the informal settlers to the relocation site. After the project site was cleared, architects Teodoro Trinidad and Jose Mercado drew up the blueprint for the Patria de Cebu for free. “This design is capable of taking the seismic shocks of earthquakes giving the Patria the distinction of being the first structure in Cebu City to enjoy this feature,” Morrell wrote. Use of the building evolved over the years. It served not only as a youth recreation center, but also as a convent. Then a portion was converted into offices of the Archdiocese of Cebu and its various units. The building also bore witness to Cebuanos’ efforts to ensure a free and honest elections in 1986 as it provided office space for the National Citizens’ Movement for Free Elections (Namfrel), a civic volunteer organization that sent out volunteers to serve as poll watchers and conduct Operation Quick Count. A PEBBLED pedestrian walkway. A piazza with a fountain. A lovely promenade garden. By the summer of 2021, these Rome-inspired features will connect a Catholic church steeped in history to a planned integrated retail, office and hotel structure. These will also serve as the centerpiece of the celebration of the 500th anniversary of Christianity in Cebu. Listed property developer Cebu Landmasters Incorporated (CLI) promises to blend heritage with contemporary design through the Patria de Cebu redevelopment project. Patria de Cebu, a 6,670-square-meter rundown Catholic Church-owned building across the Cebu Metropolitan Cathedral in downtown Cebu City, currently hosts the offices of the Archdiocese of Cebu’s various commissions and a hostel or dormitory for visiting clergy, lay people and pilgrims. Its redevelopment is expected to catalyze the revitalization of adjacent properties and reinvent the urban fabric of Cebu City’s waterfront area. CLI, which was proclaimed the winner among five bidders in a closed bidding conducted by the Church, has committed to transform the area into a heritage site with a commercial component. “One of the more important elements that gave us the (Church’s) nod, aside from the financial package that we proposed, is the heritage content. Even the exterior look, the roofing of what we came up with is consistent with that of the Cathedral,” said Jose Soberano III, CLI president and chief executive officer. More than the financial returns that the project is expected to bring, Soberano said CLI simply wants to help the Church and contribute to the preservation and enhancement of the cultural heritage of downtown Cebu. The project will kick off the redevelopment of the Catholic Church’s properties surrounding the Cathedral, the first Christian church built in Cebu. The original structure was built near Fort San Pedro, but the church was later reconstructed and elevated to a cathedral called the Metropolitan Cathedral of St. Vitales. The Cathedral is the seat of the Archdiocese of Cebu. Soberano said the Church has asked CLI to help draw up a master development plan for the rest of its properties near the Cathedral, including the Cathedral Museum of Cebu. When completed, the entire area will form part of a heritage trail in the downtown area. The site is located a block away from the Basilica del Santo Niño, the second Christian church built in Cebu which was constructed to mark the site where the image of the Holy Child Jesus was found. About two blocks away is the pre-war Gotiaoco Building, Cebu City’s first four-story airconditioned office building which has been restored and transformed into a Filipino-Chinese museum. Soberano also sits in the board of the Sugbo Chinese Heritage Museum Foundation Incorporated, which is undertaking the restoration of the Gotiaoco Building. About three blocks away in the opposite direction is the Parian District, site of the Heritage of Cebu Monument by sculptor Eduardo Castrillo, the Museo de Parian (Jesuit House of 1730), and Casa Gorordo (home of the first Filipino bishop of Cebu), among others. CLI is poised to spend about P1 billion for the construction of the integrated retail, office and hotel structure to replace the rundown structure of Patria de Cebu. The company has given the Archdiocese of Cebu an initial P50 million to cover the rent for the property in the next four years, while construction is ongoing. Under a 40-year lease agreement signed with the Archdiocese on October 29, CLI will pay a monthly rent of about P1.2 million upon completion of the project. The amount will increase by 2.0 percent every two years and by 10 percent every 10 years. After 40 years, CLI will turn over the project to the Archdiocese. But CLI will also have the right of first refusal to continue with the lease. “But of course that would depend on whether the Church would like to continue leasing it out. Because the Church might just want to recover it and convert it to something else,” Soberano said. He said they have started working on the regulatory permits for the project. Current occupants of Patria have until the end of December 2018 to move out, after which the building would be demolished and work on the new structure would begin. The property is small, about twice the size of the Senior Citizen’s Park near the Gotiaoco Building. CLI will construct two buildings that will be connected. One will have six stories, the other will have 14. The structure will contain a hotel, office spaces, and retail space, including a supermarket. “We could overbuild. But as mentioned, the financial return is not the main consideration for us when we entered this deal. We would just like to help the Church,” Soberano said. The hotel, envisioned to be a business hotel, will have 160 rooms and a grand ballroom, among others. “This time, we will run this. This is something that we are going to devote a lot of time to,” Soberano added. CLI has partnered with the Radisson Hotel Group for a Radisson Red in Mandaue City, the first in the country, and The Ascott Limited for its serviced residences. The Patria hotel is seen to address the need for a venue for the reception for church events, such as weddings, baptisms, anniversaries and others. Churchgoers will just have to cross to the Patria for their parties. The roadway between the church and Patria would be transformed into a pebbled pedestrian walkway that would be closed to vehicular traffic. The church grounds, currently used for parking and a garden, would be devoted entirely to a promenade garden. A two-level parking area that could accommodate more than 300 vehicles would be made available at the basement of the new Patria building. The target is to complete the grounds portion by March or April 2021, in time for the 500th anniversary of Christianity in Cebu. “There’s going to be a lot of open space, at least 40 percent of the land area,” Soberano added. An entire floor of the new Patria building, meanwhile, will house the Chancery’s new offices, rent-free. Soberano assured that Patria’s history, especially the Ave Maria blocks, will not be forgotten. “We will have a permanent marker there to show the history of the place. This has been discussed with the Archdiocese and with our planners,” he said. PATRIA de Cebu was built not with a flick of a wand, but with the courage and perseverance of some Catholic students in 1954. The students had to hurdle at least two major challenges and even deal with persecution, said Father Brian Brigoli, chairman of the Commission on Culture and Heritage of the Archdiocese of Cebu. “It’s not a magical thing nga derecho ra siya og tubo. It underwent a lot of struggles, underwent even persecution before this building came about,” he said. The students and their mentor, Father Bernard Wrocklage, SVD, had to solve two problems - where to get the funds and where to relocate the informal settlers who were occupying the project site. Brigoli said one of the informal settlers did not want to move out and threatened to strike a student with his bolo. “It was an offering, a sacrifice,” Brigoli said. The would-be assailant backed off. "This was really a test of faith, endurance of faith (because) even to the point of death, people are tested and tried about their resolve to really build this building and almost being martyred along the way,” he added. The sacrifices made by Wrocklage and the students will not be forgotten, Brigoli assured. When developer Cebu Landmasters Incorporated (CLI) tears down the building in early 2019 to pave the way for its redevelopment project, Brigoli said the Church will keep some of the so-called Ave Maria blocks and use these to build a marker. Making the Ave Maria blocks was the “most important” part of the Patria’s history, Brigoli said. The students each made their own hollow blocks and prayed over these with a Hail Mary (Ave Maria). Thus, the name Ave Maria blocks. The Ave Maria block marker, along with a planned diorama, would "perpetuate the story and the memory of the Patria building so that the people will always remember,” Brigoli said. These two features will serve as a reminder of how the Patria was built and the struggles and trials faced by its builders. These will also complement the planned monument to commemorate 500 years of Christianity in Cebu. “So that we will be creating something that’s still sensitive to its past, sensitive to its heritage value,” Brigoli said. The proposed development will include a Rome-inspired public plaza, which is targeted to be completed in 2021 in time for the 500th anniversary of Christianity in Cebu. The plaza, along with the landscaped Church grounds and a pebbled walkway in between, will serve as centerpiece of the archdiocese's celebration. It took more than a year before the project took shape, Brigoli said. The Archdiocese, which wants to maximize the benefits from the Patria, invited developers last year to draw up redevelopment plans for the 6,670-square-meter property across the Cebu Metropolitan Cathedral. There were five companies that presented their business and development plans, which were evaluated roughly four months ago in terms of the kind of proposed development, potential of generating revenues and social impact or corporate social responsibility, Brigoli said. The Church eventually chose CLI, a homegrown company that is listed on the Philippine Stock Exchange. CLI, through president and chief executive officer Jose Soberano III, and the Archdiocese of Cebu, through Cebu Archbishop Jose Palma, signed a 40-year lease agreement on October 29 for the redevelopment of the property into a mixed-use project. CLI will spend around P1 billion for the project, which will contain a hotel as well as office and retail spaces, including a supermarket. 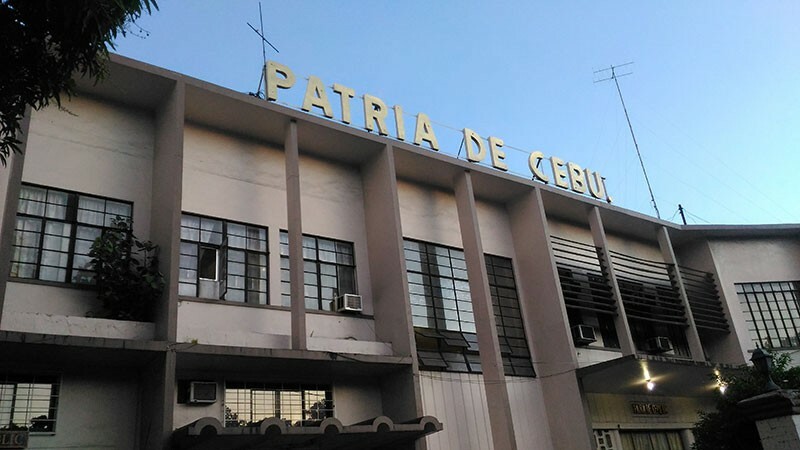 Patria de Cebu was envisioned mainly as a recreation center for the youth. Over the years, the building was also used as a convent and, in 1986, provided office space to the National Movement for Free Elections (Namfrel). The Church also converted a portion of the structure into a budget-friendly hotel intended for pilgrims. Today, it houses a hostel and the offices of various commissions of the Church such as the Chancery, Office of Economic Affairs, Tribunal Court, Pastoral Planning Board and Diocesan Curia. It was the first building in Cebu City with the tie beam system to make it resistant to earthquakes. When the 7.2-magnitude destructive earthquake struck Cebu and Bohol in October 2013, the building sustained only minor damage, Brigoli said. The Patria is the second Church property in Metro Cebu to undergo redevelopment. The first is the two-hectare lot in Barangay Mabolo which is being developed by Duros Land, the company that built the International Eucharistic Congress (IEC) Pavilion. “We welcome change and the Church uses its resources to its utmost use to really maximize the usage of the property,” Brigoli said. The property is still owned by the Church, with CLI paying a monthly rent for its use. “This is a BOT (build-operate-transfer) agreement. Within 40 years, the Landmasters will build and operate, then they will return everything to the Archdiocese,” Brigoli added. “It would just be a new face, a new exterior perhaps. The story of what it took to make Patria continues,” he said.